Not generally a big fan of The Telegraph‘s views, but this is an interesting one. According to Henry Paulson, former U.S. Treasury Secretary, America risks losing its superpower status unless the world’s biggest economy, which currently finds itself in a rare position of weakness as its industry isn’t operating at its full potential, begins to tackle its deficit. Telegraph: “I can’t think of any time in history of a superpower continuing to be one if they don’t have a strong economy and fiscal system”, Mr. Paulson told a gathering of investors in New York yesterday, mainly referring to the country’s deficit which is projected to reach $1.34 trillion this year, according to estimates from the Congressional Budget Office. “Our problems are obvious. 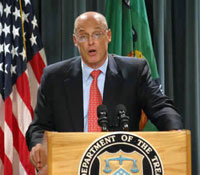 Ones that we can fix and got to fix”, Paulson said.